No Surgery Face Lift Treatment in Manhattan Beach Los Angeles: Attractive faces are often described as having high cheekbones, a small nose, big eyes, and full lips. That being said, much of the population is not born with these features. For those seeking out a more alluring and youthful look, often times they turn to surgery. These face lift surgeries involve extensive treatment that needs significant aftercare. Generally speaking, face lift surgery involves surgical stretching and stitching of the skin or facial implants to add definition. Although surgically inserting these implants is one way to achieve such a look, there is now another much less invasive option to enhance your cheekbones and overall facial structure. No surgery facial contouring using dermal fillers is also known as a liquid face lift, this is a fast and effective option to achieve the desired face lift without any daunting surgical procedure. As the body ages, the face begins to droop as it loses the fight to gravity and natural volume is lost. The options for non-surgical face lift have no downtime while erasing years off a patient’s appearance. Such options include dermal fillers and ultrasound therapy. No surgery face lift options have taken great leaps forward in recent years, with both facial skin tightening devices and injectable fillers helping make the face more voluminous. What Are the Benefits of a Face Lift Without Surgery? Cheaper than surgery:It is less than ten percent of a surgical face lift. Many people wish to have some form of a face lift but, the price of surgery can be daunting. A non-surgical face lift is less invasive so it requires less equipment which brings the cost down. Little to no downtime:As non-invasive facial contouring is mostly injections, there is minimal pain and discomfort. The areas that were injected may feel sore or have some small bruising but, that will go away in a day or two. No surgery face lifts typically will not interfere with a patient’s daily life. Able to be modified with facial changes to ensure a natural look: By using dermal fillers, Dr. U can see the changes that happen to the face immediately and compensate for any variables. Radiesse is also known for its ability to be sculpted slightly after injections which helps in achieving a less artificial look. Surgically transferring fat to the face does create the longest lasting results. That being said, all injectable treatments do not require any surgical procedures. Currently, the most common forms of non surgical face lifts include ultrasound therapy (Ultherapy) and dermal fillers (Radiesse and Sculptra). Often times these methods are also combined. Uses ultrasound to lift and tone the skin. First and only ultrasound energy-based device for cosmetic procedures approved by the FDA for use as a non-invasive face “lift” procedure. Different from lasers as they typically only improve the superficial layers of the skin. Treats the deeper skin layers most commonly treated by cosmetic surgery that supports the skin. Upper layers of the skin are bypassed. Energy is delivered to the correct depth in order to contract and lift that foundation layer of skin. Allows us to see where the energy will be delivered. Sculptra: Sculptra is a poly L lactic acid (PLLA), which is a synthetic biodegradable polymer that is absorbable as well as bio-compatible. PLLA has been used widely for years in dissolving sutures so it’s body compatibility is conclusively proven. While not a wrinkle filler, Sculptra adds volume by stimulating the body’s collagen at injection sites thus, restoring lost volume and contours to achieve a younger appearance. Radiesse: Using Radiesse offers a minimally invasive option in enhancing the face’s shape and is one of the more common methods for a no surgery face lift. Its unique qualities are that it both adds volume and provides support. Once injected, the microspheres create a scaffold under the skin to lift the cheekbones. Dr. U will shape the mass to achieve the patient’s desired outcome. The sessions take approximately 20 minutes, and the effects are immediate. Dr. U prefers this method because of its reliability and long lasting results. Because Sculptra relies on the ability of PLLA to absorb fluid and puff up the injected area, the result is not as predictable. Also, the PLLA needs to be constituted a day before procedure typically. For these reasons, Dr U prefer to use Radiesse for his no surgery liquid facelifts. Please be aware that Dr. U does not use Ultherapy for non-surgical face lifts. His preferred method is using Radiesse or other dermal fillers. If you are interested in non-surgical face lift treatment services, sign up for a free consultation at Dr. U Skin Clinic. You will be able to have your questions answered and learn which cosmetic procedure would be best for achieving your goals. You may fill out our consultation form at the top of the page. To get started, fill out our consultation form or call us at 1800-499-DRUCLINIC (3782) to schedule an appointment. Who is a good candidate for non-surgical face lift treatments? A typical patient is someone unhappy with their face aging. Other candidates can be young patients wishing to stay ahead of the aging process. Patients who want to complement other procedures are also considered good candidates. The truly ideal candidate would be in their forties or fifties and are just starting to notice sagging and drooping in the face. If I want another non-surgical facial contouring (or Facelift Without Surgery) procedure, what is available to me? Nose jobs: In non-surgical nose jobs, Radiesse is injected into the nose to help smooth out irregularities in the bridge of the nose. Once injected it fills depressions and creates a kind of scaffold to decrease the appearance of any bumps. Radiesse does not reduce the nose’s size. It only improves the nose’s contours. Radiesse also does not change the structure of the nose. As it is much less invasive than surgery, there is no need to disrupt a patient’s work schedule or daily activities. Lips: Lip enhancement can be achieved with fillers like Juvederm. It is a great option for enhance lip contours as it augments tissue by increasing how much water the lips hold. The resulting supple lips are caused by this increase in hydration. Injectable dermal fillers are the most common for lip enhancement. Wrinkles: For people wishing to lessen the look of wrinkles, non-surgery options include using lasers to treat sun damaged skin and facial fillers. Botox is the most popular/famous wrinkle treatment however, there are other fillers that work just as well like Juvederm and Radiesse. How long do non-surgical face lifts or Liquid Facelift last? Non-surgical face lifts also called liquid facelifts are not permanent. They last for a period of a few months to a year with some patients report it lasting longer. The face will continue to age and touch up treatments will be necessary to maintain desired look. See the results a non-surgical jowl lift by Dr. U in Los Angeles. 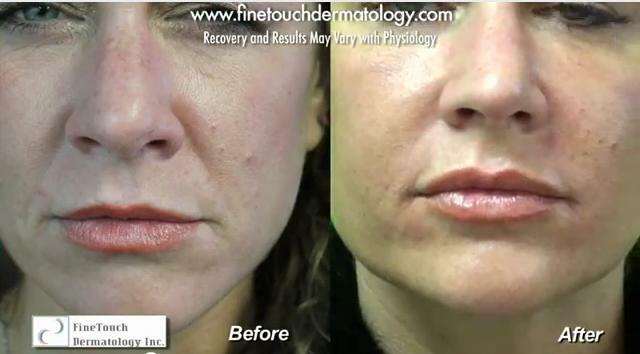 View more patient examples of successful Radiesse treatments by Dr. U.